In Tamed, Alice Roberts uncovers the deep history of 10 familiar species with incredible wild pasts: dogs, apples and wheat; cattle, potatoes and chickens; rice, maize and horses—and, finally, humans. She reveals how becoming part of our world changed these animals and plants, and shows how they became our allies, essential to the survival and success of our own species. Enlightening, wide-ranging and endlessly fascinating, Tamed encompasses thousands of years of history and archaeology alongside cutting-edge genetics and anthropology. Yet it is also a deeply personal journey that changes how we see ourselves and the species on which we have left our mark. "A masterpiece of evocative scientific storytelling." —Brian Cox, author, Why Does E=MC2? Alice Roberts is an anthropologist, writer and broadcaster. Her previous books include The Complete Human Body and The Incredible Unlikeliness of Being, and she hosts such BBC series as The Incredible Human Journey and Origins of Us. 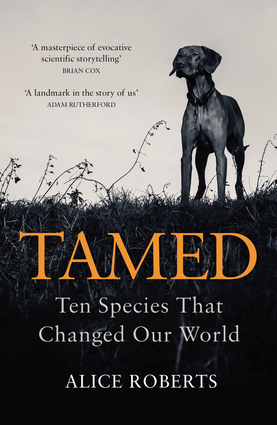 Tamed was a Book of the Year 2017 for the Economist and Mail on Sunday.